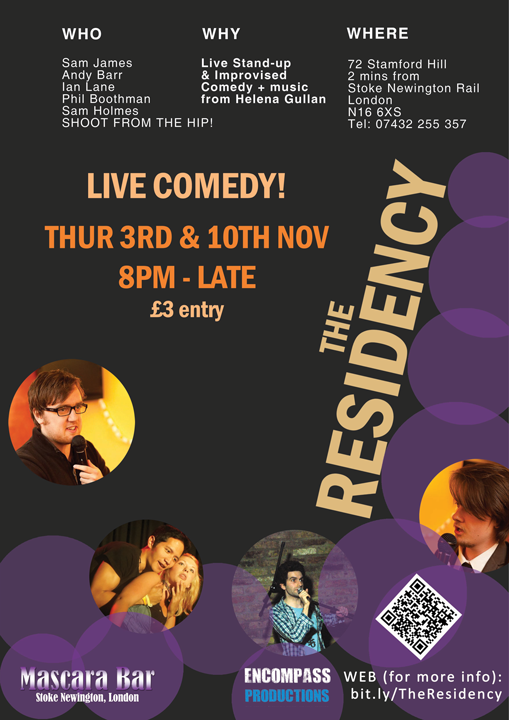 We've already had The Residency: Live Comedy Nights at Mascara Bar, London bringing the funny twice this month and now...THE RESIDENCY HITS THE END OF NOVEMBER IN A BIG WAY WITH TWO MORE EVENTS! Is there anywhere better to spend your Friday night? We think not - so come along! What a night! Bring yourself, your friends, your family, your loved ones, the bloke off the street...this music needs to be heard and we want you all there in support of it! Encompass Productions will be giving a talk at Goldsmiths, University of London on November 30th. Jonathan Woodhouse (Founder & Artistic Director of Encompass) will be giving an insight into the process of forming a new company - the trials, the tribulations, the highs and the lows, and will also be answering questions from students. "I'm very honoured to be a guest at the UK's leading creative university. Encompass is only nineteen months old and despite its success so far we are very much a company still in its infancy - however I believe Goldsmiths has the right idea in asking a new company to talk about their experience so far. It keeps things relevant, allowing us to more closely reflect on our process and the challenges of being a new company existing in the current arts climate. It means we can be realistic and optimistic at the same time. We hope the talk will be both informative and inspiring." 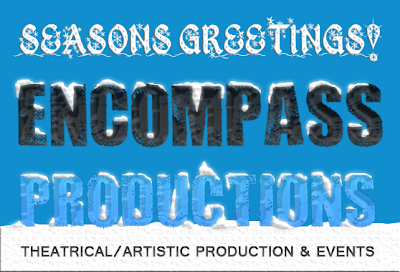 Joining Jonathan from Encompass will be Christopher O'Shaughnessy, Researcher and Dramaturge for the company. A portion of the talk will also be dedicated to a Q&A on 'The Lady', the upcoming motion picture from legendary filmmaker Luc Besson. The film chronicles the life of Burmese democracy leader Aung San Suu Kyi (Michelle Yeoh) and her husband Dr. Michael Aris (David Thewlis), with Jonathan starring opposite the pair as their eldest son 'Alexander Aris'. More information, images and trailers from the movie can be found at http://www.useyourfreedom.com/. NEW VIDEO SKETCH FROM SHOOT FROM THE HIP! 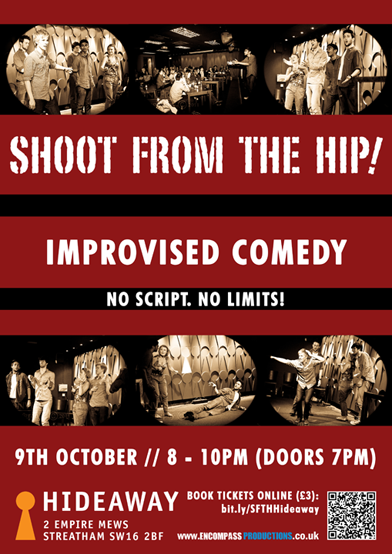 Our resident funny people loved performing at the first two comedy Residency events this month...but they've also been hard at work at writing and filming some new sketches! Check out what life is like with the Pumpkin Queen at the link below - let us know what you think! 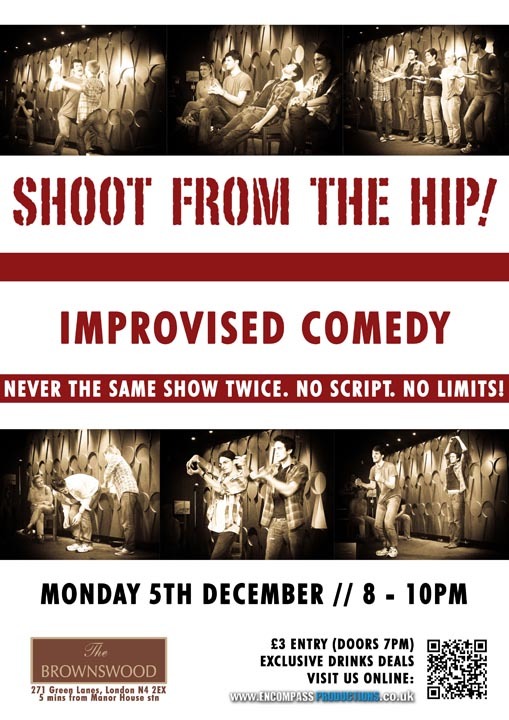 We've got more hilarious sketches for you coming soon, as well as an improv show at The Brownswood on Monday 5th December! More details soon! In case you've missed it, we recently announced our next artistic endeavour. 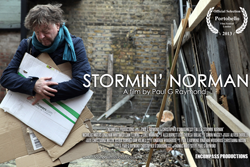 Stormin’ Norman is a short film written and directed by Paul G Raymond, produced and created by Encompass Productions. Stormin’ Norman follows Norman, a homeless man living in the London suburbs. We journey with Norman through the ups and downs of his everyday life until he meets Sarah, a young woman who dares to break the routine. The company are incredibly excited about this brave new adventure, which is expected to start shooting in Winter 2012. The piece is currently in research and development and the cast will be announced in December. We'll have vacancies for film crew positions available with more information soon. Interested? Email us! Paul G Raymond serves as the media coordinator of Encompass and was most recently seen playing the part of 'Lester' in our hit production 'What It Feels Like'. 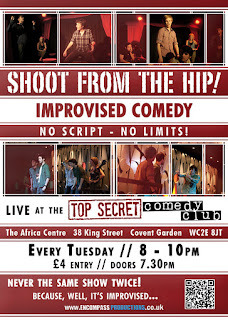 He is also a performer in our improvised comedy troupe SHOOT FROM THE HIP! - you can find out more information about Paul here. -A brand new 'videos' page for SHOOT FROM THE HIP! 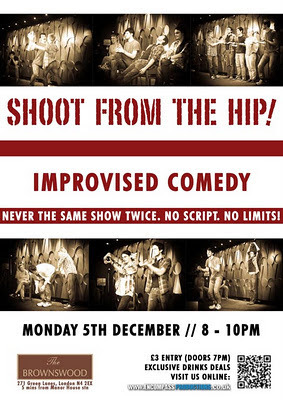 where you'll be able to watch all their brilliant comic sketches! We hope to see you at one of our many upcoming events and shows! Stormin’ Norman is a short film written and directed by Paul G Raymond, produced and created by Encompass Productions. The company are incredibly excited about this brave new adventure, which is expected to start shooting in Winter 2012. The piece is currently in research and development. Cast and crew placements will be announced soon. Paul G Raymond serves as the media coordinator of Encompass and was most recently seen playing the part of 'Lester' in our hit production 'What It Feels Like'. 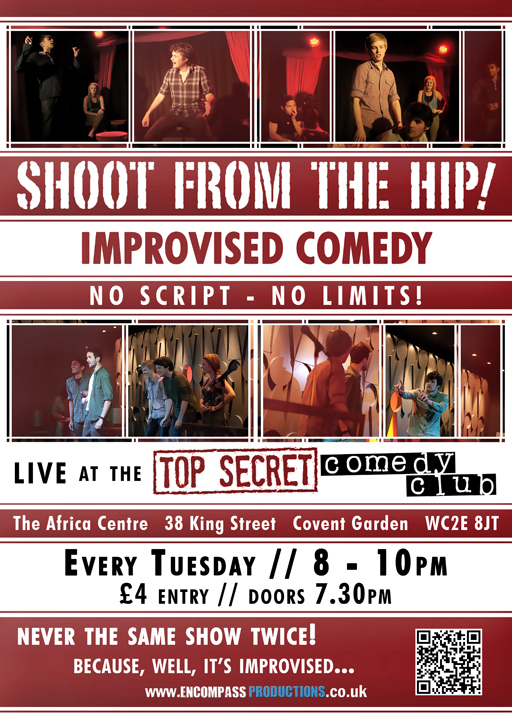 He is also a performer in our improvised comedy troupe SHOOT FROM THE HIP! - you can find out more information about Paul here.. 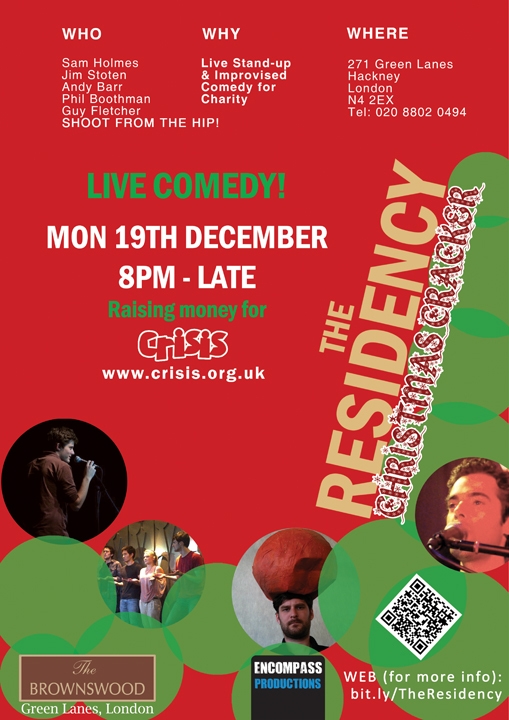 THE RESIDENCY COMEDY NIGHTS START THIS WEEK! On both Thursday 3rd and 10th November MASCARA BAR in Stoke Newington hosts not only our very first London events but our first COMEDY NIGHTS! -The old news page has finally been replaced with a news widget that allows you to see all of our feeds from this blog, Facebook, Twitter and even YouTube. We hope it'll be a drastic improvement! -A brand new 'productions' page where you can find out about our past, present and future productions. We'll also be announcing if there are any opportunities to join our projects! We hope to see you at one of our London events soon, and hope you all keep up-to-date. 'Stormin' Norman' is the first of many announcements to come! 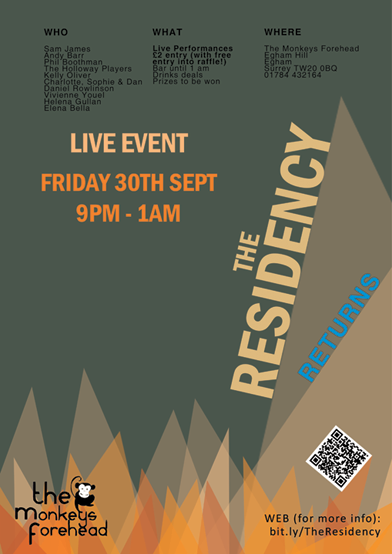 With this amount going on there simply is no other place to be this Friday 30th September. 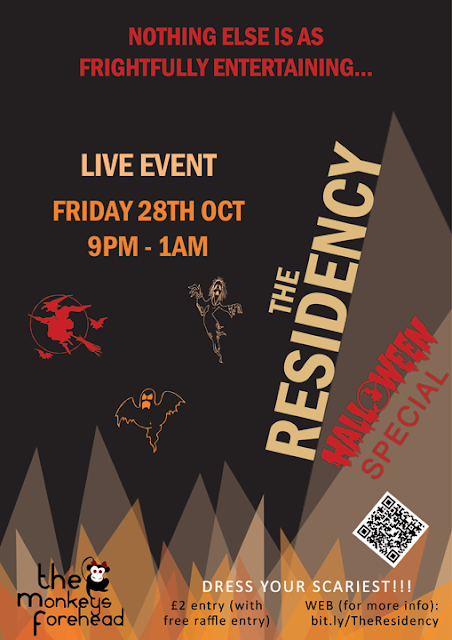 We're at the tail end of Freshers' Fortnight, so it's guaranteed to be a good one! It's good to be back...be there with us! BACK FROM THEIR HIGHLAND FLING...AND RETURNING TO THE BIG SMOKE! 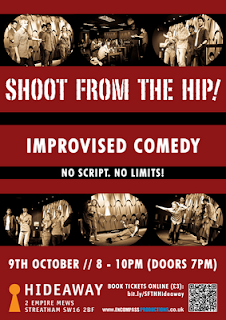 Fresh from their guest appearances at the Edinburgh Festival Fringe, SHOOT FROM THE HIP! 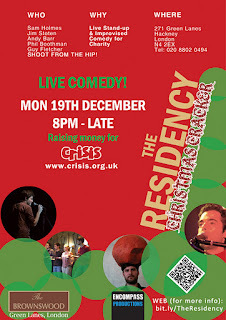 are back in London town - and Paul is still with them (he did win the first IMPROVAGANZA 2011 there after all). Promising to be harder, better, faster and stronger (without the use of steroids) our comedy funsters are all geared up to have you laughing until you ache...and that's just before the interval! 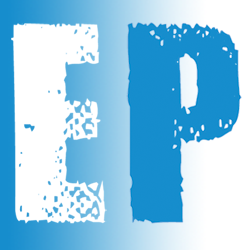 Following many meetings, emails and new scripts, expect us to announce the first of our new artistic projects soon. Following the fantastic success of 'What It Feels Like' (★★★★★ EdFringe Review/★★★★ Fringe Guru/★★★★ Hairline), we're excited to be able to tell you about the first of our next endeavours! -Brand new 'History' page on our website, where you can see what we've been up to since our formation! 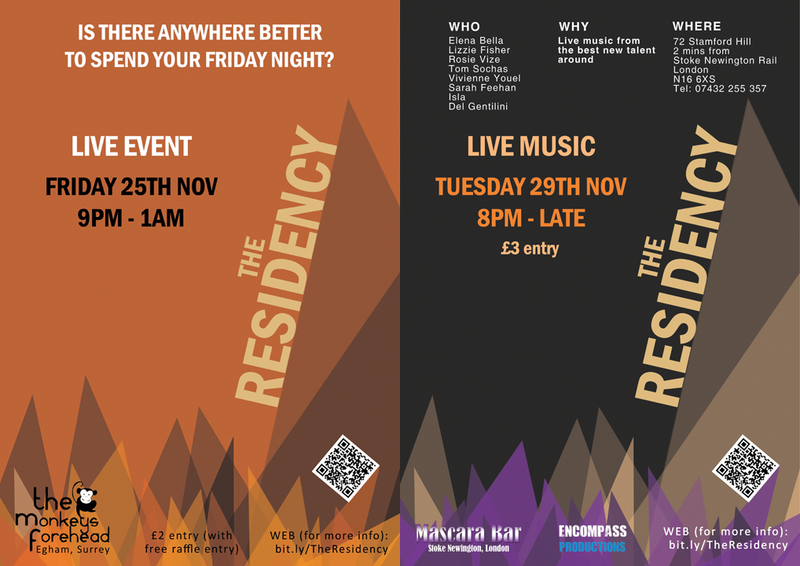 We hope to see you at either THE RESIDENCY this Friday and/or at SHOOT FROM THE HIP! in two weeks! We've also got great prizes to win as well as special drinks deals on the night. With this amount going on there simply is no other place to be on Friday 30th September. 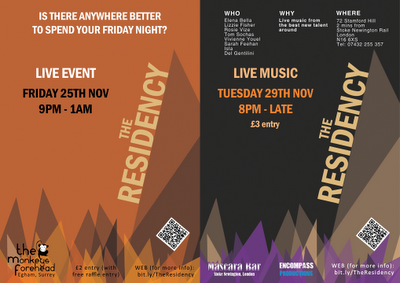 We're part of Freshers' Fortnight, so it's guaranteed to be a good one! Don't forget we've still got many new photo albums on our Facebook page and the 'What It Feels Like' website for you to look at it - why not check them out?